We were afraid of this picture. First, of course, we did not like the original story, Henryk Sienkiewicz’s title novel. Few are familiar with it in Ukraine, but everybody knew that it was anti-Ukrainian. And the Polish side did, too. 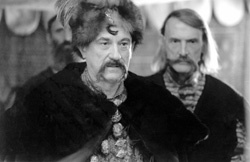 Once they threatened to use the script if we proceeded with Gogol’s Taras Bulba. There are several screen versions of the latter in the West and none in Ukraine. Oleksandr Dovzhenko started on one back in 1941, but then the Nazis invaded. In the 1960s- 1970s, Sergei Bondarchuk followed suit and he was said to be able to pull any stunt at the time, including getting anyone buried in the Kremlin wall. He must have pressed the issue with Filipp Yermash, then Chairman of the Goskino State Cinematography Committee of the USSR who arranged for Bondarchuk to meet with the Polish leader (I think it was Gomulka). Several days passed and no one saw Bondarchuk, although we knew that he had returned. And then we had a meeting or something and Yermash, spotting Bondarchuk in the crowd, asked him out loud, “So what happened, Sergei? Did your Polacks help you?” Rather a rhetorical question, because Warsaw stood its ground: you try Taras Bulba and we’ll start on With Fire and Sword. Well, we were bound by brotherhood, so no one wanted to do anything rash. Years later, in 1997, we heard that the Poles were on to it again, this time deadly serious, and that the film would be directed by Jerzy Hoffman, author of two other Sienkiewicz renditions, The Deluge and Pan Michael. And what made things even worse was that Bohdan Stupka, one of our living national symbols, had agreed to play Khmelnytsky. The national-patriotic hard-liners raised a hue and cry: Traitor! Death to Poles and traitors! That same year, a worried Hoffman explained at the Stozhary festival in Kyiv that there was nothing to worry about, that there would be nothing Ukrainophobic about his new production. The plot was very like Gone with the Wind, the morale being that all wars end the same way, in ruin and death. The picture starts with Bohdan Khmelnytsky being chased by Czaplincki’s lackeys and a Polish aristocrat, Szczetucki (Michal Rzembowski), helping him out of trouble. Then we see Bohun (played by Aleksandr Domogarov, an actor from Moscow) head over ears in love with Polish beauty Helena (Izabella Skorupko) and the beginning of deadly rivalry between him and Szczetucki. Now and then both appear as diplomatic envoys, although there is so much hatred between Poland and Ukraine that all diplomatic efforts look futile. Moreover, both ambassadors are in love with Helena. Bohun loses his own battle and in the end finds himself in Szczetucki’s hands. His death seems unavoidable, but the enemy sets him free, returns his weapons, and lets him gallop off into the boundless steppe. This scene crowns the picture and lest the audience have any doubts about the moral, the author gives a short off-screen commentary, recalling the actual outcome of the Ukrainian-Polish confrontation: Poland was defeated, but Ukraine also suffered heavily, leaving the Russian empire the third winning party; Russia swallowed up both Poland and Ukraine with gusto and took a very long time digesting the meal. So let us remember this bitter historical experience and keep our swords sheathed, never giving vent to our animal instincts. Both the Ukrainians and Poles demonstrate outbursts of instinct in Hoffman’s picture. The man kept his word: not once during the three hours of the film were my national feelings hurt in any way. There were two groups ready to fight to the last man, matching one another. Bohdan Stupka’s Khmelnytsky looks remarkably dignified, even though lacking common sense. Colonel Kysil offers a truce, but no one wants to steer a middle course. And the peacemaker arouses hatred and disgust. How can one discuss reconciliation against the backdrop of burning towns and villages, raped sisters and impaled brothers? A detailed analysis of the film’s technical merits and artistic impression rates a different story. It will be written, of course. All I can say at the moment is that the production is highly professional, especially in crowd scenes, something we have not seen for a long time. There was no Church Union. Shevchenko wrote this on June 22, 1847, as an inmate of the Fortress of Orsk. Jerzy Hoffman made his picture with a clear heart, dedicating it to his wife Valentyna, a former Kyiv resident. She died several weeks before work on the film ended, turning it into a specially memorable epitaph. Its sentiments belong to the coming millennium, or so I wish to believe with all my heart that we will live to see that little paradise restored, but not before we start living a normal life. Each and every one of us is supposed to have been made after His Image. Shall we ever measure up? The Polish filmmakers have made their noble gesture. It gives one hope, and I am certain I am not overstating it.